On Friday the 8th of December, trading on the euro/dollar pair closed slightly down. The euro dropped to 1.1730 ahead of the payrolls report, recovering to 1.1772 after its publication. The US employment data that came out on Friday wasn’t bad. The US added 228,000 new nonfarm jobs in November against a forecast of 190,000. The reading for September was revised upwards from 18,000 to 38,000, while the October figure was revised downwards from 261,000 to 244,000. The aggregate revision comes to +3,000. US unemployment remains at 4.1%. The workforce participation rate is also unchanged at 62.7%. The number of new jobs exceeded expectations, but markets couldn’t ignore the weak level of growth or the revision of average hourly wages. The average hourly earnings index in the US came to 0.2% (forecast: 0.3%, previous reading revised from 0% to -0.1%). The euro’s rise was less down to the NFP and more to do with the growth on the euro/pound cross. The pound shed 0.67% in Friday’s session, with the yen losing 0.32% and the euro 0.03%. The franc and the Kiwi and Aussie dollar closed up. At the time of writing, the euro is trading at 1.1784. The price is currently sitting at the upper boundary of the A-A channel on the 45th degree. The LB balance line (sma 55) runs through 1.1774. 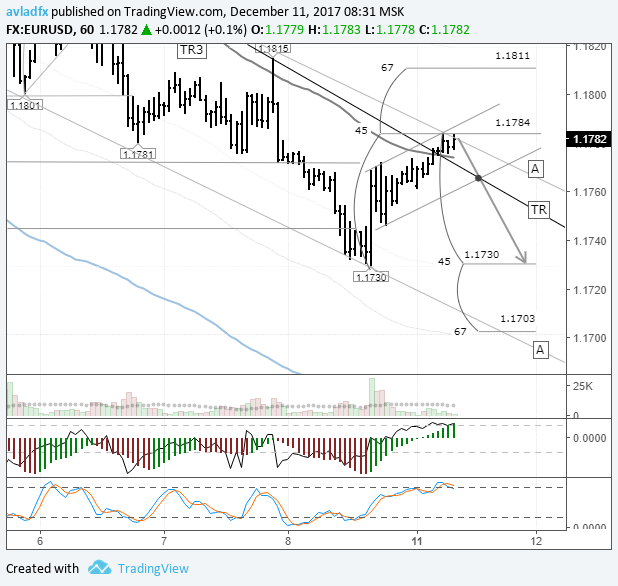 Considering the position of the hourly indicators and the lack of economic events today, I’m expecting the euro to drop to 1.1730 (45th degree). For now, I can’t see the euro dropping any further than the 45th degree given that a pin bar has formed on the daily timeframe and the stochastic oscillator is reversing upwards. Another important point of how forex market works I’d like to draw your attention to is that the TR trend line drawn from 1.1935 has been broken through. I’m ignoring this for the moment because of the A-A channel. If the euro rebounds from the channel’s upper boundary, this will confirm that it was a false breakout. In theory we could drop as far as 1.1730 or lower. For now the main thing is to get back below 1.1770. Trading in London opens at 11:00 (GMT+3). Hopefully, the euro will open down when trading gets underway. This would keep buyers at bay while increasing the probability of a rebound from the upper boundary of the A-A channel. The FOMC meeting is on Wednesday. Interest rates are expected to be raised by 25 base points. Congress has reached an agreement to extend federal funding through the 22nd of December. President Trump has already signed the bill.